Sandi ready for the Tea Party! NEW! Be sure to visit the Mentors Table for an easy Circle Block demonstration! General Meeting ~ 9:30 a.m. 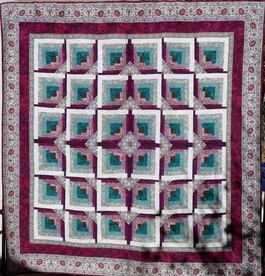 The Chino Valley Quilters are proud to present a beautiful quilt pieced and sewn by Elsie Robinson. View a larger image and more information for our 2014-2015 Opportunity Quilt. The proceeds from the raffle tickets sold for our Opportunity Quilt helps to pay for the supplies used to make our Comfort Quilts. The Comfort Quilts are presented to families in need and other charitable organizations within our community. To purchase tickets for a chance to win this year's lovely bed quilt, please see 2014-2015 Opportunity Quilt. Visit our Opportunity Quilts Page. Happy Birthday to our Ladies! *Reminder: When your birthday falls within our meeting month, please remember to bring a gift with a value of approximately $10.00. A suggestion would be to think of something small that you would enjoy for yourself. What do you mean Barn Quilts? A group of girl scouts finds our Chino Valley Quilters' website and tells us about Barn Quilts. 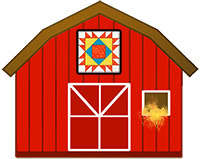 Read more about Barn Quilts here. . .
Like a beautiful garden, our resources continue to grow. Resources from our quilting library and travels, both real and virtual. Quilting tools and gadgets, tips and tricks, quilt blocks and patterns, websites and blogs, and more resources for quilters. Come to enjoy the relaxing and fun festivities; music, booths, wine tastings, gourmet food and, of course, stroll with the beautiful peacocks on Saturday and Sunday; May 9th and May 10th (Mother's Day). Hours are 11:00 am - 5:00 pm. The Chino Valley Quilters will be there to present the Beautiful Elsie's Garden raffle quilt with a chance to buy raffle tickets.